I finally finished up the cover. 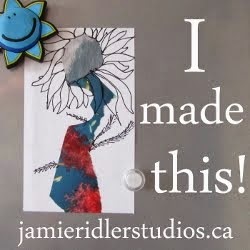 I used some distress ink over it all to tone down the colors a little and embossed some swirls on it. Then added the fringe, just because! 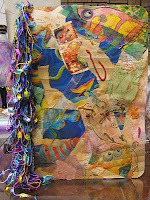 I also attached a multicolored fiber bookmark. I lined it with some fabric that I had that I really like. My second page echoes the "Art Saves" theme. The photos have not turned out the best. My lighting needs improvement, I think. 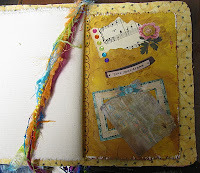 I have gathered up many goodies to construct pages with as the journals come my way. I am so excited to send my journal out on its first journey. LOVE your fringe, susie! absolutely gorgeous!! i'm adding mine at the end, when my book comes back to me. happy playing!!! Nice work looks like you enjoyed making that. Susie, The fringe is wonderful...I may have to add some as a final touch to mine when it comes home! I just checked and the journal arrived in our main post office this morning. So, at least by tomorrow I should receive it...can't wait! Love your warm yellow pages! 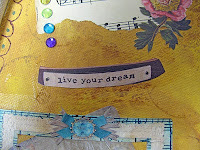 Live your dream page is too. I opened the box! Your journal is in great shape and is delightful! I like the larger cover and the fringe! I keep looking at the pages and enjoying the amazing details and colors!